Sara Adamsson was as happy as she could be after she married the man of her dreams, Christer, in their home country of Sweden. Sara and Christer loved Thailand, and wanted to have a second wedding on a beach in the country. So off they went with their two-year-old son, Johannes, and Sara’s mother, Marianne Tivemark. 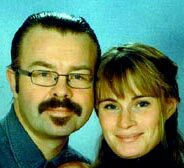 On Christmas day 2004, Sara and Christer held their second wedding. The ceremony went extremely well and Sara said that it was the best day of her life. But the next day, December 26, 2004, the tsunami hit. Sara, her mother and her son were on the beach and Christer was in the hotel. The wave swept away Sara’s mother but Sara was able to grab her son and run behind a house. But the house quickly collapsed as the wave crashed into it and she fell and lost her grip on her son. Even though the force of the wave was so great it was almost impossible for her to continue holding her baby, she still feels deep guilt. "I can never forgive myself for dropping my baby. I will always see his eyes when he disappears," she said. And she now is holding out hope that somehow her family will be found alive, but she knows that they probably died. Either way, she want to see them all again. "I want to find my family dead or alive to get peace in my soul. I am so afraid, that I never get any answers, that I will search for my baby for, my husband, my mother, for the rest of my life."